Just about everyone likely to read this post probably agrees: Ambelopoulia poaching is a problem and even an ecological disaster. Where opinions might differ here at 10,000 Birds is why this illegal bird trapping is, well, illegal or a problem. In fact, from responses I’ve seen here and there from trappers themselves, it’s perceived by the trappers that most of us here are upset about the trapping because it’s cruel. That’s an Animal Rights-related concern. Their counter-argument is that, since we’re concerned about this trapping because it’s animal cruelty, we should be equally upset by poultry and hunting practices, that lead to the unkind treatment of chickens, turkey, pheasants, partridges, quail, pigeon, etc. — but we’re not equally upset about those things, making us hypocrites. And if that were our argument, they’d be right. The Animal Rights approach is emotionally understandable, of course. Typically, we as birders find the practice of shooting or trapping any birds to be distasteful (to say the least). Most of us feel the same for similar treatment of mammals and other animals as well. And it’s perceived by hunters and trappers that we just see something cute, our brains shut off, and we jump into action as though we were radicals. And it’s easy to ignore or dismiss radicals – especially when you consider that the logical conclusion is veganism. And even I think that that’s radical. The Conservation approach however, comes across as measured and reasonable: While we’re not fans of inflicting suffering of any kind on animals, the larger concern is the conservation of species and their populations for posterity’s sake. Absolutely no one thinks it radical to be concerned about preserving a world worth living in for the sake of our grandchildren. 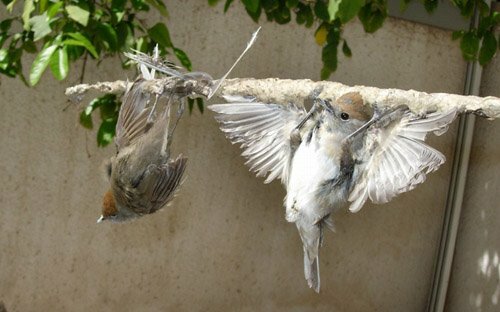 This argument is persuasive, and the trappers’ only response is to deny that limesticks or mist nets are indiscriminant trapping methods that kill individuals of over 150 different bird species in Cyprus, including at least 30 vulnerable or threatened species – a denial that’s easily refuted by cold, hard data. But I understand that amongst birders there may be a fair portion of Animal Rights’ apologists. Maybe some people of this persuasion would care to comment (Please do so). Incidentally, you may think veganism is too radical, but unlike the vast majority of people on the planet vegans (and I’m vegetarian, but not vegan) don’t harm, abuse, or exploit wildlife in any way whatsoever, and that’s rather admirable is it not? Sorry for the delay in responding – I was in a class. First things first, I’m sorry if I offended, but do want to clarify that by ‘apologist’ I merely mean ‘one who uses rhetoric for activism that is different from mine.’ No offense was intended, nor do I see how that word is particularly offensive even now. I do have to confess however that the post was meant to be a little provocative, in the hope that the post stirs discussion of the merits of various rhetoric or activism though… So I thought that the larger (2nd, 3rd and 4th) paragraphs would be the focus of responses, not the last bit. And you did in fact also respond to the points I was hoping to receive responses on. Such as your response mentioning Dodos and more. Do you not think then, that the world loses something with the loss of a species? And, is knowledge of something really a pre-requisite for its existence to matter? And is this activism for justice and what the animals deserve, or is this activism for preserving the quality of the environment. These are two different things, and as I understand it you are dissociating yourself from the latter activism. On the other hand, it is the natural state of things that all animals exploit other organisms in some way or another in order to live (I’m choosing my words carefully here). I find injustice towards animals to be distasteful. Truly I do. But is the Animal Rights’ perspective truly an agenda for protecting species and ecosystems, or individual creatures? I am not sure why you think it is radical to choose to be vegan. It is a measured step undertaken by an individual to minimise the amount of harm done to other creatures and the planet in their name, and I see nothing very radical in that goal. Cruelty toward animals, especially in the name of consumptive products, is born of greed, greed can and does lead to species extinction, species extinction leads to an imbalanced ecosystem, so for me the three are intrinsically connected. By greed I mean taking more than is require to survive. Cypriots do not need to eat small birds, they simply like to, but they could still thrive physically and culturally without. The difference between an actual natural trophic chain and what humans percieve as a natural trophic chain is that other species take enough to survive, humans tend to take more than they need, driven by a hunger for the false commodity we call money, and not by hunger for sustenance. I agree with Dan that there are at least two separate issues with regards to the trapping he illustrates, the cruelty and the impact on endangered species. But setting aside the conservation impacts, I still think there are two separate issues that might be lumped together roughly in the animal rights camp but I still think are distinct. Assuming that you were hunting (somehow) a wild species, there is the question of whether it is ethical to do at all, and the question of how it was done. Everyone here would agree that trapping with glue is astonishingly cruel, as such we would all oppose it for animal welfare reasons. But Charlie would I suspect argue that even if there was an uncruel way of trapping birds, and that the species being trapped would not be negatively impacted, it should still not happen. This is not a welfare concern, or a conservation concern, this is a animal rights concern. The motivations that drive conservation are many. Some people are driven by pragmatic utilitarianism, others find reasons from their culture, religion, from a love of nature, or from a fundamental belief in the rights of animals. So when Charlie asks if being motivated by a concern for animals rights ” make[s] me less of a conservationist?” the answer is no, but at the same time, not being motivated by a concern for animals rights does not also make one less of a conservationist. And in the story Dan covers and the issue fights, the conservation concern is not related to welfare, but the fragile state of the bird populations. -Thanks for the comment. I say “radical” because it’s taking that interest, “to minimise the amount of harm done to other creatures and the planet in their name,” to its furthest logical conclusion. Taking anything to its furthest conclusion is by definition radical to me. However I freely note that sometimes radical positions are completely defensible. -Of course I agree with you that there is nothing inconsistent with protecting an individual species and protecting an ecosystem. The position I was trying to describe is that it is not always consistent to try to protect every single individual life and protecting species or ecosystems (e.g., for invasive or over-populated species such as cats or rats in various places in the world, which are threatening vulnerable species). -Indeed, it is a bit of a Chicken or the Egg dilemma I bring up: these are separate but interrelated issues. And perhaps some will judge that it is folly to disentangle them. But I suppose that’s for the commenter to decide. -Yes, well-put on distinguishing the animal welfare and animal rights issues. Damn, a whole perfectly crafted response disappeared into cyberspace – damn, damn, damn..
That’s unfortunate for your first draft – I hate that when that happens. Maybe it’s a British vernacular thing, but really I’ve referred to, say, Intelligent Design apologists as such and they actually prefer it to other monikers. As for Radical, I really don’t know of an application of philosophy to diet that is more radical than Veganism, so it seems fitting. Also it’s not as though Veganism is close to mainstream even in the UK or the US, and for Cyprus it is literally unheard of. Amongst Cypriots, vegetarianism is even considered radical (although that is a bit more mainstream in the UK and the US), and even vegetarians would be hard-pressed to find a traditional Cyprus restaurant that has even one suitable entree dish listed on their menu. So for those reasons plus the fact that we agree I’m using the words correctly, honestly, I don’t see how one could mistake these two words for being derogatory. Another reason why I see Veganism as radical: I think it’s fair to say that going Vegan is a radical lifestyle change. There’s nothing small or easy about such a significant behavioral change. I see Charlie and Maria disagree – could you help me understand why you view this as a non-radical lifestyle change? You’ve chosen a really odd element of our responses to focus on. As I explained, both ‘radical’ and ‘apologist’ are used in both the mainstream media and in common parlance as a dismissive term to show that you don’t agree with what the radical apologist is saying because they’re wrong and ‘out there’. You must have known that’s how your remark would taken especially when used in the context of a post that includes the memorable phrase “The Conservation approach however, comes across as measured and reasonable”. The message was all too clear: you the conservation scientist is measured and reasonable, whilst us emotional types “jump into action as though we were radicals”. And it’s easy – don’t forget – for you “to ignore or dismiss radicals”. Dan, my suggestion would be that you either rewrite your post to make it more clear, or stick with what you wrote and understand that – as I said initially – your words were unnecessarily provocative, by which I mean dismissive, divisive, and attacking the wrong people. Oh, and comparing my grasp of my native language with that of radical intelligent design apologists? Gah. Now you’re really winding me up. Frankly, you seemed like you were a bit wound up right off the mark. Radical – Whoa, okay, you’ve completely misunderstood that aspect of my post then. I was very explicitly saying that that is how Animal Rights’ activists are seen by many of the people that you’re opposing. My intent was very clear – I wasn’t trying to wind anyone up, I was trying to provoke merely a discussion of strategy. And the in general opinion of BirdLife Cyprus is that Animal Rights’ activism would fail where conservation and data collection are making headway. But you do believe in Intelligent Design don’t you? I thought that was synonimous with being a Vegan. @Dan: I think you have set up a couple of completely false dichotomies here of rational/emotional and animal rights/conservation. It is also disingenuous to draw lines down the middle and say someone else’s argument is emotional, which you set up as the opposite of “measured and reasonable” and then act surprised when people are bothered by that. Personally, I can think of quite a few reasons why animal rights are rational, measured, and reasonable, and I think if you thought about it a bit you could too. I can also think of ways that conservation is emotional. Heck, I can think of situations where animal rights is conservation and vice versa to say nothing of emotions being rational. That you would apparently be unable to overcome the counter-argument that the hunters make to the animal rights position, which essentially boils down to “Hey, look, other cruelty over there!” surprises me. I thought that everyone was familiar with “Two wrongs don’t make a right.” There, hunters/trappers counter-argument nullified (and I won’t even charge for it). Finally, if you insist on using these dichotomies, do you think that it is the numbers that are being spouted that are getting international attention or the pictures like the one you used in this post of a cute bird stuck to a stick? I think we both know the answer to that, which is why images like this are used in almost every bit of promotional material about this issue. Those “emotional” arguments look pretty good in that context, don’t they? I think we should be using every single tool in our toolkit to defeat the hunters and trappers of Cyprus except for the one used here (the circular firing squad). Why is it that commenters keep thinking that I’m trying to call these positions irrational? I’m not saying that – I’m saying that it’s perceived as irrational by a number of people in this country. Please, guys, stop shooting the messenger. I laugh at people saying they are against? animal cruelty or eating animal meat. Last time i checked, plants are also considered living things. How do you know they don’t feel pain and they don’t suffer? So eating plants is not considered as causing pain to a living thing whereas eating animals is considered causing pain. A wild lion killing a zebra is considered nature but when a man kills a cow to eat it it’s considered inhumane and people should be vegetarians and blah blah blah. That’s not an uncommon argument here. It’s irrational and nonsensical, but it reveals a common view that people like us are all Animal Rights’ people who are idiots. That’s not my view – mine is critical of Animal Rights’ but I’m specifically taking every effort to not be dismissive. And judging from this conversation on 10,000 Birds, I expect Charlie and Corey to view my simple posting of this person’s comments as derogatory. But somehow us activists here in Cyprus have to deal with these opinions in the effort to actually make a difference on the trapping front. According to you guys, I’m derisive simply for considering this dilemma. Go on and read my comment exchange with “panace11” also – rather than getting upset with his irrational point of view in support of trapping, I explained to him that while some of us may be Animal Rights’ supporters, others among us are not, and there are a lot of other reasons for opposing trapping. And I won him over to agree that one way or another enforcement of anti-trapping laws is 100% necessary. Those are the tactics that are necessary in Cyprus, however much the Animal Rights’ approach may work for you in the UK or elsewhere. Additionally Charlie, Martin Hellicar touches indirectly (and admittedly only very briefly) on this point at 22:30 in the TN005 podcast episode — without the data and the conservation approach, the Cyprus officials would dismiss BirdLife Cyprus’ case against the trapping. I read your blog entry the day I finished a chapter in a book on wildlife ethics – how provocative and stimulating for me to hear real people wrestling with real issues. Thank you for this. I’m been involved with avian ethics for some time now and here’s my take on it. I don’t think “animal rights” is opposed to environmental ethics. It’s not an “either/or” situation. Perhaps on paper or in a philosophical discussion these views might sound polarized, but in reality when we look at people’s behaviors, values, ideology, and values orientation we find that people employ a mixture of all kinds of views, and never consistently. Our subconscious minds rule the day so very often in the decisions we make every day. I believe that ethics is not a prescribed formula, but a community process. Part of this process is interpersonal and intrapersonal skills, and another part is knowledge, and another part is principled ethics, and a major part is coming together to hear the needs of all beings and work together to come up with synergetic, creative solutions. I don’t think there is any way we can avoid making tragic choices in our lives, but together we can minimize the harm we do – to other species and our own. And it’s hard to get creative and hope to integrate our minds/values with our behavior if we spend our time and energy discussing principles that we don’t really stick to anyway. I wonder if any of this is making sense, or resonating? I’d love to hear what you and others say, especially if I can add clarity to my writing. It’s not an “either/or” situation. I think that was Duncan’s point as well, and perhaps you’re on to something although I’m not certain. That is, I think it depends on how you define Animal Rights: people who readily lump Animal Welfare with Animal Rights probably see Animal Rights and Conservation as very intermingled as you say. For me however, I see Animal Rights as a specific philosophical add-on to Animal Welfare that distinguishes it from AW. In that case, this philosophical add-on to me is in conflict with conservation (in a few ways, which I could provide examples for if wished for discussion purposes). Am I saying then that Animal Rights and Conservation are always in conflict? No, I suppose I’m not saying that. The way you refer to ethics however – Ethics aren’t necessarily the same as Rights, are they? If they’re just mostly the same, as I would think, could you elaborate on where they are the same or different? But it’s an interesting point to add to the main thrust of my blog post, which was that whether or not Animal Rights and Conservation are in conflict with each other, members of BirdLife Cyprus seem to be frequently mistaken for Animal Rights supporters. Some may be, and most may be at least a little supportive of Animal Rights, because as you say most people employ a mixture of all kinds of views, but not all for certain. And whether some support Animal Rights or not BirdLife is in fact a conservationism organization. My experience, and the views of BirdLife staff that I’ve spoken to, confirm the sense that this misconception amongst many Cypriots is counter-productive. Why so? Need it be so? Does that mean we should distance ourselves from Animal Rights’ rhetoric to achieve our conservation aims? These are all academic questions I suppose, but deserve to be addressed. I’m not an ethicist however, so perhaps you could expand upon that a bit? Wound up? It’s been a bad weekend. Dan, I’m with you a 100% – it was going great up until that last sentence, but what you wrote was easy to misinterpret. No worries. Let’s just get those trappers, break them, and help wildlife. Yeah, I was getting wound up a bit too I think, and I think I could’ve given Corey a bit more patient a response too. And you’re right to note that I’m quite biased against AR and its core philosophy, but really I was trying to keep that out of this as best as I could. Apologies also for writing an easily misinterpret-able post, too. Thank you for your continued seeking to understand – so we together can make some sense of what is best to do for the birds and people in Cyprus. I don’t know if these following words of mine will help clarify or not. Mostly what I see is this. The term “animal rights” is not helpful in the long run for what we must do with the messy and mostly tragic decisions surrounding nonhuman animals. Speaking of “stances” such as “rights” versus “conservation” polarizes us and I believe takes away energy and thinking (and causes blame to which you allude) from our efforts to help the birds and support one another. I say this from years of listening to “rights” folks and “conservation folks” and “research folks” etc and the terms just seem to get in the way. I am working with “needs based ethics” that brings compassion, science, and social sciences to our process so that we don’t divide into camps of “us against them” and can stay at the table with the needs of all species/individuals on the table. It’s messy and uncomfortable, however I have hope that we can make better decisions if we don’t look for “rules” or “philosophies” that we don’t ever really adhere to anyway. Are my words any help here? That’s interesting that you refer to labels, which surely are polarizing. I find it interesting because it’s not so straightforward to get away from using them: we need some sort of shorthand for comparing the differing perspectives and their strengths/weaknesses. That’s how we evaluate different strategies and approaches. Regardless however, the problem in my opinion isn’t so much the academic disagreements between “animal rights” and other groups when it comes to species’ protections. It’s the perception of these factions by the general public that we’re trying to persuade in order to effect change. Part of the problem is simply education regarding these problems, and also notoriety. I.e., animal rights as a movement has a much longer history than conservation biology, which provides a scientific basis on issues that broadly overlap with animal rights, and as a result few people understand or even know about conservation. Additionally, part of the problem appears to be push-back against animal rights by the people that we’re trying to persuade towards species’ protections (Frequently the middle-ground that we’re trying to persuade are hunters or people who have similar points of view to hunters). I don’t know what I’m suggesting or should suggest though. I suppose I’m just voicing my perspective on this apparent dilemma. Oh, and your “needs based ethics” sounds very interesting. I hope to hear more about that while following your blog. Dan, this whole discussion does seem to be a little unnecessary if you dont take the time to really show us how being an animal rights activist has concretely complicated things for species conservation or for the hard work of wildlife conservationists. I personally have a degree in Conservation Biology and a Masters in Behavioral Biology, and I still find it in my heart, my mind and my profession to avoid infringing on the right an animal has to a life without cruelty. Ethics help unite these two points of view, since scientific ethics, are encouraged in all projects, and mean that what scientists do should be done in a way that basic animals’ rights, and the species importance is and are respected…Im not saying individual scientists always do what they should do, nor am I saying that animal right’s activists always do what they should do…but those who dont, give a bad name to the others who do, and that goes for both sides. But the big picture, for me at least, needs to be clarified. What is happening that brings you to start this discussion, and isnt it more productive to see how these different parts of people (because most folks have these different parts in them somewhere) can be channelled to positive solutions? I would like to hear or read something more like…hey, there is this problem, how can we use all the different philosophies out there to solve it? The inhumane trapping of a bird species that unintentionally traps other species, thereby affecting their populations is an issue with many sides that you can take advantage of instead of argue with, it seems self defeating. Not to be inhumane is one matter that is cultural (and animal rightsy). Children are very passionate about injustices, but they need to be told what is an injustice in their culture. Education for children on this topic will go far. For adults, education about ethics and world views will help if you can manage classroom time with them (hunters and trappers), showing lots of examples and alternatives. Trapping techniques you can turn more scientific, and show them the ways birds can be caught without causing harm to other species. Species population and conservation is another topic, and they should learn all they can about the ecological niche of the other species they affect and of course the one that they are trying to trap. Diet is cultural, and again, you need education and alternatives for those who eat the birds, not just those who trap the birds. And, finally, the economic gain from selling the birds they trap can be confronted with economic alternatives, teaching them something new to do, like hunters frequently make very good ecotour guides, research assistants, and i have even seen some make good wildlife photographers or artists. sorry, this got too long! Im sorry, I meant to mention that the general public will have its opinions about every topic or label, that shouldnt be a concern…it is an obstacle that all professions come up against. Labels are unfortunate because they dont allow for growth inside a particular philosoph or profession, conservationists may always be seen by some as radical activists, but by others they wont be seen that way. Imagine, my mother has been a licensed massage therapist for over 25 years who specializes in cranial manipulations and neurofeedback, and there are still some in the “general public” who only see her office as a decoy for “seductive and vulgar practices”. But what is true, is that there are many more of the general public who run to her when they get hurt or need help, and that is what she concentrates on. So, oh well, we just show them they are wrong by being good at what we do, for all the reasons we believe in, and hopefully the birds, and the folks that live around them, will benefit in the meantime. Thanks for the comment. Yes, it’s difficult to quantify the extent and ways in which I think animal rights activism is confounding the issue in Cyprus. Apologies for that – I wish I had data prepared to share with you more than the anecdotal cases I listed above. I still find it in my heart, my mind and my profession to avoid infringing on the right an animal has to a life without cruelty. As do I, except in describing it as a right, but you may argue that that’s a quibble. But don’t you think that there’s a difference though between that the effort against a life without cruelty, which is a concern for the well-being of creatures you come across and which I share, and ascribing inalienable rights to an animal in the way that you would a human? I would like to hear or read something more like…hey, there is this problem, how can we use all the different philosophies out there to solve it? I don’t think that that’s a bad idea at all, and thank you for your suggestions on possible approaches! And regarding your add-on comment, I thought of that, and in the end you’re probably right. Some members of the public will be against anything, no matter how sensible it is. So this is probably nothing but a purely academic discussion if that’s the case. Still, if it is the case, I’ll still have found the feedback from discussion on this thread valuable. Well, yes, i agree with your idea about the word “right” when talking about animal wellfare…probably the reason it has turned into a right is to give it a place inside the chapter of rules and regulations of industries like pharmaceutical testing, the meat industry and medical experiments…places that need to have rules that structure the methods that are employed, giving clear limits to what is approvable and what is not. So, instead of being wishy washy with terms like animal wellfare in an environment that is obviously not looking for the wellfare of the animal, like testing the toxicity of a shaving cream, the word animal right defends the individual animal being tested from an experimental method that results in unnecessary pain (and possible errors in the results) and at the same time justifies the cost of employing an alternative method that may be more expensive but is more humane. Now, we overuse the term, and you are right…it can get confusing amongst the general public. Outside of big industries and their structured methods, probably we are mostly talking about treating others (human and nonhuman animals)with some degree of respect for their lives and for their deaths, not because its their right, but more because it instinctively feels like the better thing to do, the “right” thing to do. Money and power tend to override the instintive feeling of right and wrong, so thats why actual economic alternatives are usually needed alongside education. thanks for making me think on this a bit! I am amazed there is anything left to hunt in Cyprus. I am utterly dismayed that those who say they believe in Jesus Christ and /or Mohammed often only extend their love to humans. Animal suffering in such a small country could be so easily sorted if the people and politicians cared and acted beyond their comfort zones. So many tourists (the major income source)are horrified and saddened complaining their trip to an otherwise beautiful country was marred by cruelty, abandonment and an overwhelming abuse of animals in the main due to ignorance or for human greed. ‘Why breed and buy while strays die’. Pythagoras (ca. 580-520 BCE). Pre-Socratic Greek Mathematician and Philosopher. Saint Francis of Assisi (1182-1226). The Prophet Mohammed, Peace be upon his name. “Blessed are the merciful for they shall obtain mercy”. Edmund Burke (1729-1797) English Parliamentarian, Philosopher and Ethicist. Winston Churchill (1874-1965) Prime Minister and Statesman of Great Britain. Sophocles (BCE 495-406) Greek Playwright, Administrator, Board of Generals.